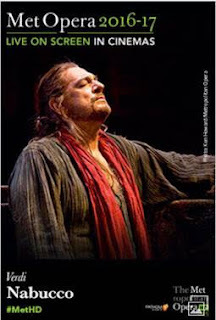 Enter to win an Admit-Two Pass to see Nabucco! Mind on Movies is very excited to announce that we are working with Fathom Events on Nabucco, in selected theaters on Saturday, January 7, 2017 (LIVE) 12:55pm ET to giveaway an admit two to select winners. Met Music Director Emeritus James Levine conducts Verdi’s early drama of Ancient Babylon, Nabucco, with Plácido Domingo adding a new role to his repertory as the title character. Liudmyla Monastyrska sings the tour-de-force role of Abigaille, Nabucco’s willful daughter, with Jamie Barton as Fenena, Russell Thomas as Ismaele and Dmitri Belosselskiy as the prophet Zaccaria, the role of his 2011 Met debut.